We kicked off our South American cross country adventure in Rio. After a few days soaking up the carnival vibe, relaxing on the city’s powdery white beaches and exploring its diverse neighbourhoods, we dove inland to Foz do Iguacu. This was the only part of our journey we did by plane as the air fares were reasonable and the alternative was a painfully long 24 hour bus journey. The flight took just over 2 hours and cost £80 each. 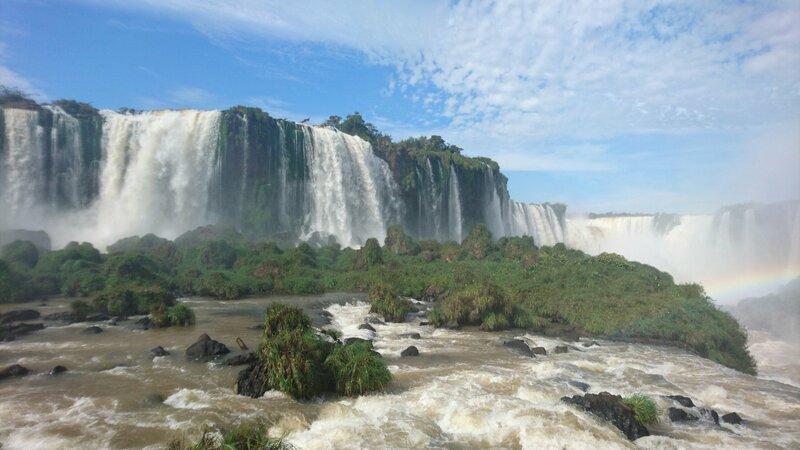 Visitors to Foz do Iguacu have only one thing on their mind – waterfalls! The town is the jumping off point for visiting Iguazu Falls, the world’s largest waterfall. With a thunderous 275 falls it delivered one the biggest “wow” moments of our trip. We saw the Falls from the Brazilian side which offers a wide panoramic view. A 1km scenic walkway threads through the trees, tantalising you with increasingly impressive views around each corner until the full force of mother nature is revealed. A wooden boardwalk takes you past the foot of the Falls to the stupendous ‘devils throat’ where dozens of waterfalls converge in a colossal roar of spray and rainbows. With an extra day you can also see the Falls from the Argentinian side which offers a close-up view of this incredible natural wonder. 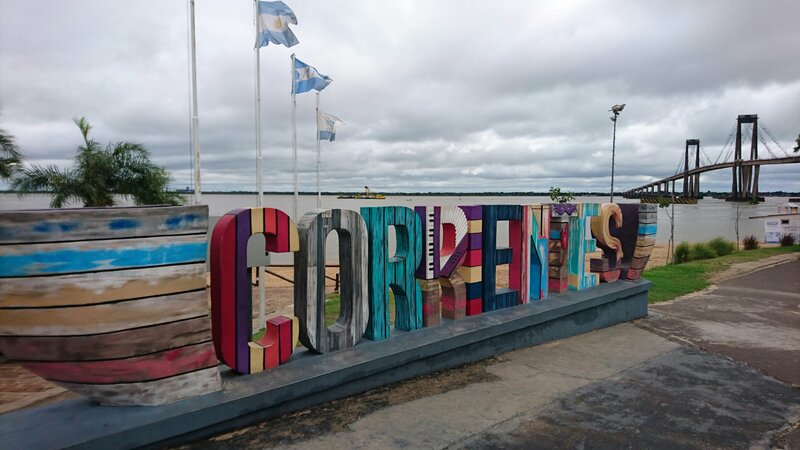 Next stop on our journey across South America was Corrientes, a city in Argentina located on the shores of the Parana River. The nine hour bus journey departs from Foz do Iguacu in the evening so you can also save money on a night’s accommodation. Tickets can be bought from the bus station on the day of departure and come in 2 classes – cama and semi-cama. A cama seat is fully reclining and wider than semi-cama so a more comfortable option for longer journeys. A cama class ticket from Foz do Iguacu to Corrientes cost us £25 each. 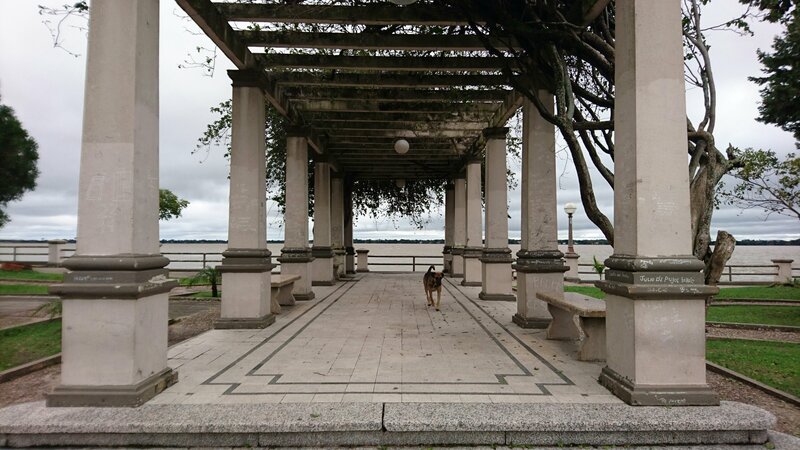 There’s not a huge amount to do in Corrientes however it’s necessary to pass through the city en route to Salta and provides a much needed break between long bus journeys. The city offers an interesting mix of colonial and modern buildings, with a couple of charming squares to wander through. Take a stroll along the pleasant waterfront and watch the locals fishing or grab an ice cream beneath the pretty pagoda while you await your bus departure. From Corrientes we took another 14 hour night bus to the picturesque Argentinian town of Salta. The journey cost us £47 each travelling cama class. Nestled among spectacular scenery in mountainous north west Argentina, there’s plenty to do in Salta. Gorgeous colonial churches fill cobblestoned squares lined with orange trees, while a myriad of tour providers offer excursions into the town’s stunning surrounding countryside. 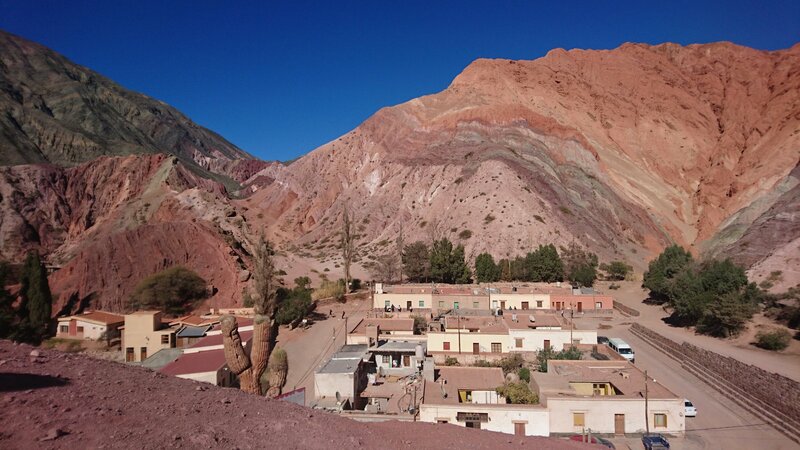 Make sure you find time to visit the multi-coloured hills of Quebrada de Humahuaca, a UNESCO World Heritage listed gorge. The drive there from Salta is breathtaking, as green hills morph into rainbow rock formations punctuated by cacti and pre Inca ruins. And if ogling spectacular scenery gets too much you can shop for handicrafts in one the picturesque indigenous villages en route. We fell in love with the warm simplicity of life here, and loved wandering the peaceful cobbled streets lined with teracotta pots and bright woven fabrics. 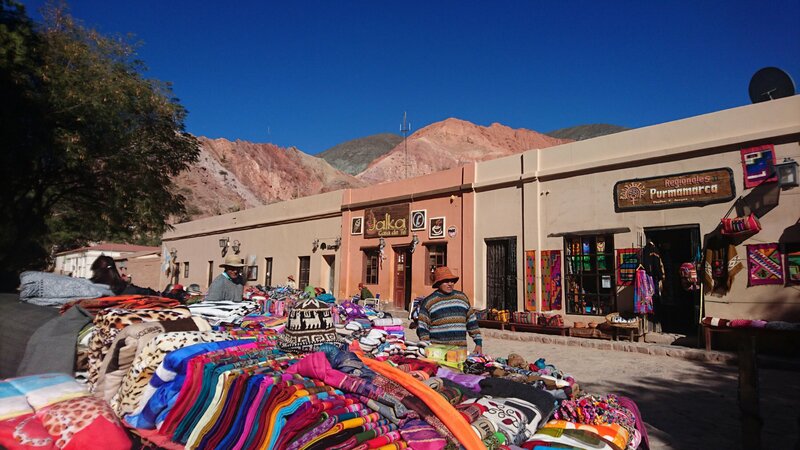 We shopped around and paid £24 each for a full day tour to Quebrada de Humahuaca which included stops in Purmamarca, Tilcara and Humahuaca villages. After blowing your budget on a tour or two, save cash and work off those empanadas with a walk up Salta’s Cerro San Barnado. A stone staircase winds through the trees and in 35-40 minutes (depending on how many empanadas you’ve eaten) you’ll be rewarded with spectacular views of the city and surrounding mountains. Alternatively ditch the budget and take the cable car! After a few days exploring Salta we boarded the bus to San Pedro de Atacama which takes around ten hours and usually leaves around 1am. This is one of the most beautiful bus journeys in South America as the route crosses over the Andes mountain range, winding through brilliant blue lagoons and glittering salt flats. Don’t be surprised if you wake to see a llama through your window! However the flip side of this is the buses are often cancelled due to snow. 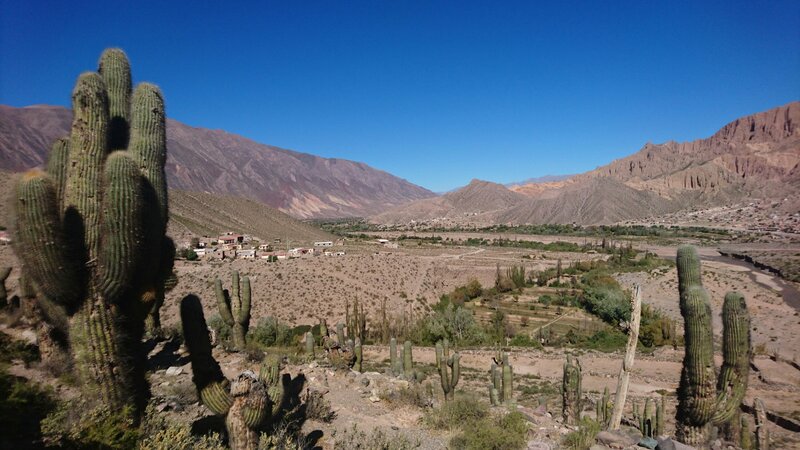 We spent two extra days in Salta due to bus cancellations so make sure your travel plans are flexible in this part of south America. You’ll also need to get off the bus at the border with Chile and pass through security which can be confusing, especially on limited sleep! The bus ticket cost us £32 each travelling cama class. 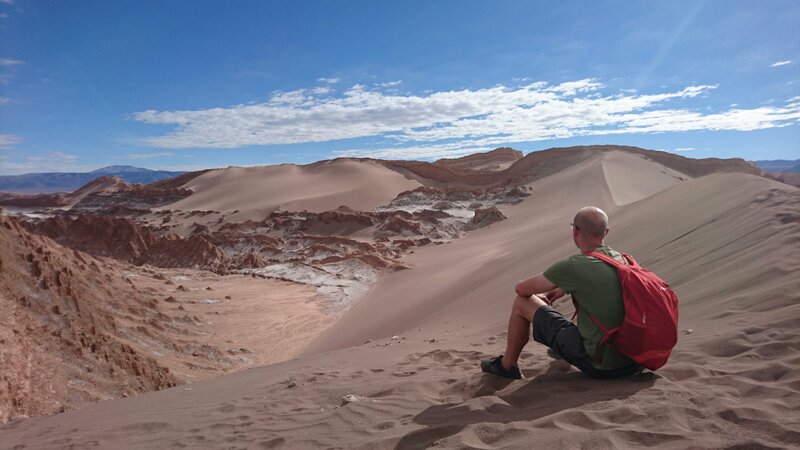 San Pedro de Atacama is one of the strangest and most beautiful places we’ve ever visited. Marooned in the heart of the world’s driest desert at a heady 2400 metres above sea level are a collection of quaint mud brick adobe houses. Throw in a handful of volcanoes, some towering sand dunes and a hundred enthusiastic, adrenalin charged tour guides and you’ve got San Pedro! With such a unique landscape, it’s no surprise that there are heaps of things to do here. However San Pedro is one of the most expensive towns in South America, so if you’re on a budget like us, you’ll need to be selective and shop around for the best value tours. If you’re travelling onto Bolivia don’t bother with any of the lagoon or salt flat tours as they’re far more impressive and cheaper over the border. Instead embrace desert life and explore some of San Pedro’s natural wonders independently. 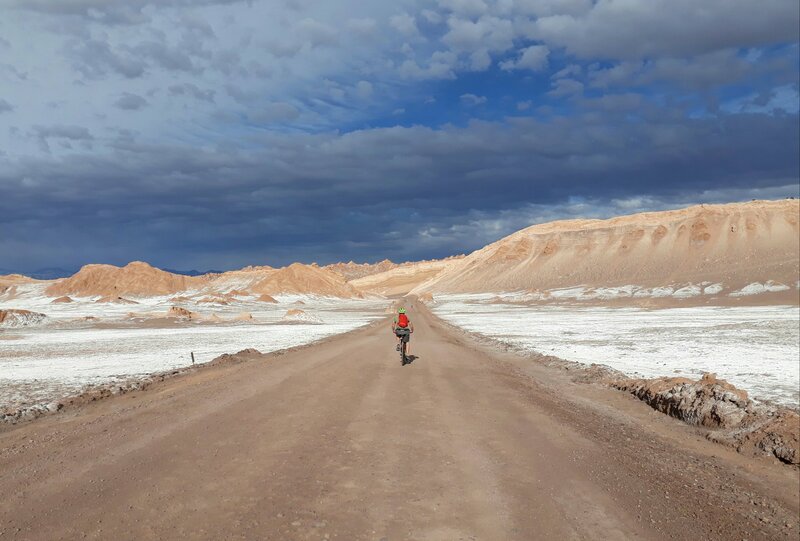 Hire a bike and pedal to the Valle de la Luna, 13km west of the town. This vast rugged landscape is said to bear the closest resemblance to the surface of the moon. 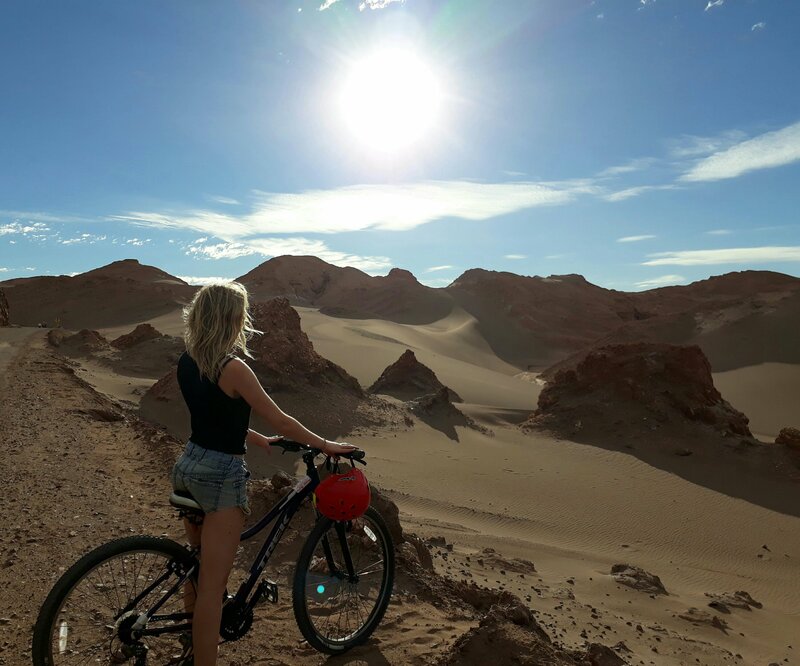 If sitting on top of a huge sand dune in the middle of the desert is on your bucket list – and it should be – be sure to take a break from the saddle to scale Major Dune. The views from the top of this mighty sand pyramid are mind blowing and if you time your visit carefully you’ll have the place to yourself. For a truly memorable experience shun the selfie stick wielding crowds at sunset and visit mid afternoon. You’ll stand beneath that huge blue sky, the desert stretching for miles before you with nothing but the whisper of sand being gently lifted by the breeze to interrupt the moment. You can then watch the sunset on the ride home. A half day bike hire cost us £7 each. 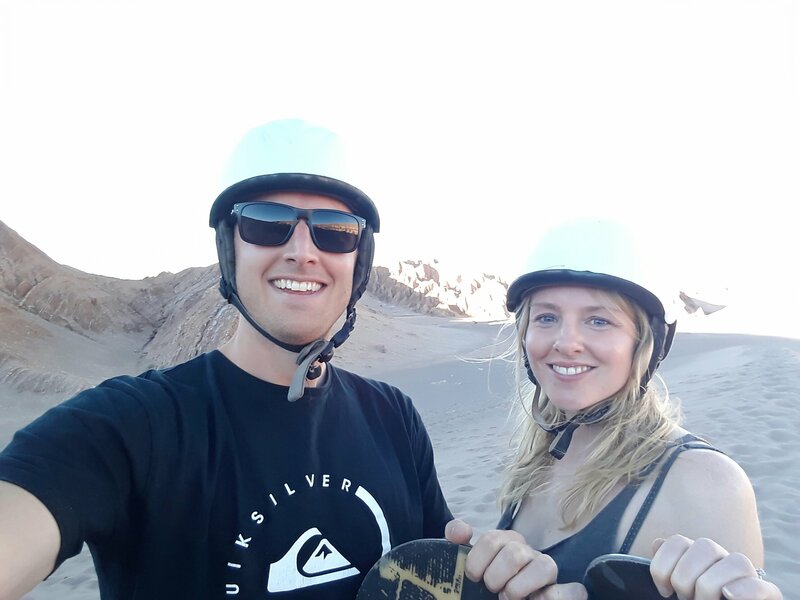 No visit to the world’s driest desert would be complete without a sand boarding lesson and where better to experience this quintessential desert activity than in Death Valley itself. We opted for Sandboard San Pedro who offered a 3 hour lesson for £25 each. The long trudge up the enormous dune was immediately worth it for the incredible views. As a first time boarder I was pretty nervous but the instructor was fantastic and helped each of us down our first run until we had the hang of balancing on the board. Two adrenalin pumping hours later and there was less face planting and more graceful gliding. We left positively buzzing having conquered a new skill in one of the most beautiful places on earth. So that concludes our seven day travel itinerary for crossing South America. With a few more days you could venture further south to the wine region around Mendoza or north into the Bolivian salt flats. But if you’re looking for a simple, direct route across the country via spectacular natural landscapes and a world wonder or two, give our itinerary a try! Let us know what you think in the comment section below or if you’ve taken an alternative route we’d love to hear about it! For more travel itineraries, tips and reviews hit the follow button below or find us on Facebook, Instagram and Twitter. Happy travels! Stress-free, headache-free travel planning, road-tested ready for this year’s budget travellers. All this accompanied with great descriptions of scenery and stunning photography! I hope those following your steps let you know how they get on. All the hard work done! Nothing left to do but pack our bags and go!